She comes out every morning with her coffee and sits on the deck. Her husband built the deck just for her because he knows how much she loves to watch and listen to the birds and other wildlife. She has always loved nature and her backyard provides solace and serenity every day. She planted me and my 14 other buddies from seed back in May. We basked in the warm sun and drank in the daily rainfall. Each day she watched us grow taller and stronger. And then one morning just a few weeks ago, she walked out on the deck with her coffee and we surprised her! The night before, we all opened up in full glory and faced the sun as it rose in the east. As she listened to the cardinals, blue jays, titmice, house finches, woodpeckers and Carolina wrens, she turned and looked our way. She saw me and my fellow sunflowers in full bloom! With help from the morning breeze, we swayed gently waving “good morning” to our lady friend. Then a beautiful smile came across her face as she gazed at our bright yellow “faces”. Our purpose has been fulfilled. All is well . . . let another beautiful day begin. Finally, we had time to take a much needed honeymoon/vacation. It was Valentine’s Day week and our first together. We headed south to Ft. Pierce and the Atlantic Ocean for sun, waves and fishing! On Valentine’s Day, we headed out early to the pier right outside our room. It was the first time Roger had been fishing in almost 7 years – something that he loves to do. He had his Shakespeare fishing pole that I gave to him for Christmas. I had my bright Jewel pink, LED blinking girlie fishing pole. We stopped at Capt. Joe’s bait and tackle shop and got shrimp bait. We also got a couple of ball caps to shade our faces from the sun! So, I had practiced casting in our backyard, so I felt ready. The only problem – I was not touching a live shrimp to place on my hook! Roger helped me out, and we casted out waiting with baited breath for the big catch! For those of you who know me, you know I’m not a patient person. I didn’t expect to cast my hook and bait to just sit there and bob with the waves while I stared at the pole to see if it was moving. It didn’t take long for me to get bored. Roger was a bit perturbed and told me to pick up my camera and he would man my pole. So I did . . . . The following day was almost a repeat of the first. However, I have to admit that I managed to catch something. Roger had gone back to the room for sweatshirts. I decided to surprise him and cast out and try my luck. As I flung the pole back to cast, it stopped short. I turned around only to find my hook caught on the pier rail. I frantically tried to remove the hook all the while looking around hoping no one saw me. And just as I got the hook free, Roger said, “honey, it looks like you caught a really nice rail fish”. Ha! Ha! Ha! I was mortified, but he got the biggest laugh of the day! Well, I sent photos back and forth to my sister, mom and dad and facebook friends. In response to my coral and seaweed “catches”, my witty sister exclaimed, “well, that’s why they call it fishin’ and not catchin’”. It was our first fishing excursion together. Afterwards, Roger threatened to never take me fishing again. We’ll see. . . I can be very relentless and persistent. The best part of the whole experience is that I was able to spend quality time with my new husband with his life-long passion – fishing! When you have suffered a traumatic loss in life, grief can be stifling and all-consuming. For me, I felt abandoned and totally alone. There was nothing but darkness all around with no vision of light. For seven months, it seemed like I moved through a fog. During this time, I started the process of building my log cabin, but it was more of a project rather than realization of a dream. It was a distraction but didn’t provide enjoyment or pleasure. I wasn’t sure that I wanted to move into the cabin, but I was determined to build it. Little did I know at the time that the log cabin construction would provide purpose to live life again. In the seventh month of existing in a dark hole, the foundation was poured for the cabin. A few short weeks later, the construction crew was ready to start stacking the logs. It took all morning for me to gather the courage to drive out and meet the crew on their first day, but I did. I never took off my sunglasses, but I forced myself to meet each guy. Every day, I showed up to watch each course of the cabin be stacked. It didn’t take many days before the engineer in me began to awaken. I asked a lot of questions about the building process. The guys began to expect me every day. The more I became involved, the more interest I took in the cabin. While I never took off my sunglasses, I began to slowly interact with the crew. Funny how six blue-collar – some crude – guys melted my cold, impersonal nature. In the crew, one man caught my attention. He was the hardest worker and most experienced but the least vocal. He was tall, dark, handsome, and I was mesmerized watching him. As he worked, I was drawn to his hands which were strong, rugged and touched every log that was stacked. I observed him through my sunglasses and caught him looking in my direction throughout the day. One afternoon while he was working on the front corner of the house, he actually spoke to me and smiled. I smiled back, all the while hiding my eyes behind my sunglasses. Days passed and it wasn’t long before the rest of the crew sensed the attraction between us, not through words but through glances and smiles. I noticed a tattoo on his left arm, but he never stood close enough for me to read what I thought might be his last name. Finally, one afternoon I managed to make out the words above the feathers below – Ani Tsalagi. That night while sitting at home alone once again, I researched Ani Tsalagi. The log cabin is a fulfillment of a dream, “something to call my own”, a beautiful start to a new chapter in my life. But it’s the man with the Ani Tsalagi tattoo who has given me a reason to love life again, a reason to smile and laugh again, but most importantly, a reason to love fearlessly once more and not be alone. “We Love You Guys” But . . .
My husband, John, was a master with people. His philosophy about people was “it doesn’t matter if they drive the truck or pick up the cans.” He motivated others by making them feel extraordinary thereby bringing out their best. He sincerely cared for others and had a giving spirit. I especially enjoyed watching him “work his magic” with service people, people who would fill a need we had, people we would only meet one or two times. One important lesson that I learned from John is that “people love to hear their name.” No matter who crossed our path, he greeted each person asking their names. Whether it was a crew to help us move, paint our house, pave our patio, maintain our yard, he knew them by name. He always provided a cooler of water and Gatorade for the workers. For the guys who moved us to FL, we bought lunchmeat, bread and chips for a “take-out lunch” before they left. He never failed to thank them by name when they were done. Throughout the afternoon, I sat on their trailer and observed. I couldn’t tell if they were amused or intimidated with my presence. They took breaks for Mountain Dew and water, but they never ate a bite. Around 4:00 p.m., they started cleaning up and packing their tools for the 2-hr drive home. Before they left, I asked, “don’t you guys eat lunch?” Glen said, “we grab breakfast at McDonald’s; we don’t have time for lunch.” Charlie could see the surprise on my face and said, “she doesn’t believe him!” Ray and Roger just smiled and kept packing up. I walked to the car and grabbed some cash. I handed it to Glen and said “have breakfast tomorrow on me.” He shook his head and said, “no ma’am, that’s ok”, but I was insistent. All of them thanked me, and they drove off. Again, around 4:00 p.m., they packed up and headed home. I told Glen that I wouldn’t make it Thursday but would be back on Friday. Charlie thanked me again for lunch, and said “you’re the best.” It felt good to hear “thank you”, like I was appreciated. I drove home fighting back tears. On Friday, I grabbed chicken tenders and a 12-pk of Mountain Dew. Luckily, I arrived before 2:00 p.m. because I learned something new. On Fridays, they leave earlier to give them time to stop by the shop office. The blue-collar construction world is new to me. It’s very humbling to watch these guys work in the hot sun, hauling logs with sweaty hands for an hourly wage. They left early so they could get paid. Week two, a rainy Monday postponed construction. On Tuesday afternoon, I showed up with Mountain Dew and water. Now, there were six guys on the crew to build the house: Glen, Charlie, Ray, Roger, Jason and Glen’s son, Kyle. I was glad I didn’t bring food because I would have been two short! But over the weekend, I had a brainstorm. I could achieve two important needs: clean out the freezer and pantry and provide lunch a couple of days a week. On Wednesday, I showed up with BBQ crockpot pork sandwiches. When they took a break, they couldn’t help but peek into the bag. They eagerly grabbed a sandwich as I walked around taking pictures of the work-in-progress. When I returned, one of the guys called out, “hey, you can cook for me any time you want!” I said, “I want to make sure our cabin is built right.” They were all smiling and said the sandwiches were fantastic. They went back to work, and I sat on the trailer fighting back more tears. By Thursday, they had grown accustomed to my daily visits. They also know I’m the General Contractor and have figured out I ask a lot of questions. (John’s nickname for me was “Perry Mason” because of my never-ending barrage of questions.) And, they reluctantly try my suggestions for process improvement. Glen found out quickly that I can read a house-plan and will point out anything that doesn’t look right. The guys worked until around 2:30 p.m. and packed up. I turned away to take more photos, and I heard Charlie say, “see you Monday.” I waved as they drove off wiping away tears. They say “actions speak louder than words”. Greeting the crew by their names . . . providing water, Mountain Dew, and homemade sandwiches don’t seem like big “actions”. But to these guys, who typically aren’t recognized, let alone appreciated, they bring a smile to their faces and maybe a small bright spot for the day. For me, they give me a feeling of purpose, if only for a day. I’m honored to share a couple of John’s simple but positively impactful life-lessons. I hope you will do the same . . . take a moment to speak someone’s name, share a drink or meal, put a smile on someone’s face. Growing up in a military family, you move around every few years. While it’s exciting to experience new cities, states and even another country, it takes a toll on your relationships, especially friends. As young girls, my sister and I did our best to make new friends and adjust to our new location throughout our school years. As we grew older, it became more difficult emotionally when we had to move again and leave friends behind. For four years, our family lived in a little town in central Illinois where my sister and I attended high school. I think from the first time I met Lori, we were friends. We took the same classes, even got sent to the principal’s office together. We spent countless hours together on weekends and during summer breaks. We played the piano together, baked chocolate chip cookies together, listened to “Dark Side Of The Moon” trying to figure out the meaning behind every song. We even got our driver’s licenses together. Not long after high school graduation, our family moved once again. Even knowing that graduation sends you and your classmates in different directions, you hope to stay close enough to see each other every now and them. Some go off to college, some start careers, some start families. . . Despite your good intentions, it becomes harder to stay in touch. You become absorbed in climbing the corporate ladder, raising children, maybe raising grandchildren, and chasing your dreams. And yet, there are some people who stay with you throughout all of life’s changes and challenges. Today, I found a book that Lori sent to me many, many years ago called “Flowers of Friendship”. There is a poem on page 67; she addressed it to me and signed it, “Your friend, Lori”. Despite all of my travels and life’s twists and turns, she has remained my friend, never judging me nor abandoning me. What a blessing for me to say that I have a life-long friend . . .
Are flowers in the garden of my heart. Bring faith and hope and love every day. Because you are a precious part of me. Jesse and his helper arrived at 9:00 a.m. and rang the doorbell. I opened the door, and he stepped off the porch and told me they were here to install our fence. He said it would probably take two or three hours. I thanked him, and closed the door. I watched out the back patio doors as they carried the materials to the back yard. They made several trips and brought their post-hole diggers on their last trip. They turned on some music, and they went to work. Every now and then I would look out the doors to see the progress. As I do every day, I stepped out on the patio and spoke to John, hoping he was watching over me. Again, I asked him to speak to me somehow; let me know he hears me. Jesse and his helper continued to work, never taking a break. By noon, it was obvious they would be there longer than three hours. They made several more trips back and forth to their trailer as they brought more materials to complete the fence. For the last hour, I watched Jesse and his helper finish the fence. They even raked the dirt and grass along the fence, and I was grateful that I didn’t have to ask them. As I watched, I started getting glimpses in my mind of our other home projects and two major relocations. We had our house painted in IL. John provided water and Gatorade to the painters, and even tipped them for a job well-done. For our move from IL to NC, we had a great moving crew. John offered a grill and several pieces of furniture to the movers that we were going to donate anyway. When the truck arrived in NC, John provided water and Gatorade to the guys, and then tipped all three as a thank you for their help. For our move from NC to FL, we had the same crew load in NC and unload in FL. John bought lunch for them, and gave all four envelopes with cash before they drove off. They had to drive around the neighborhood to head back out. As they drove by our house, the driver honked the horn and all of them waved with big grins on their faces. We had our house in FL painted last year. One of the guys even offered to repaint our outdoor lights so that they were freshly painted along with the house. John gave each worker cash before they left our house. In June this year, we had to replace our refrigerator. The two guys who delivered were terrific and even mopped the floor as they changed out the water line. John called the store manager to let him know what a great job the two young men had done with our delivery. It was then that I knew John was speaking to me, touching my heart. I grabbed two bottles of water and some cash. It was after 1:00 p.m. when Jesse rang the doorbell. When I opened the door, he again stepped off the porch and let me know they had finished. I held out the two bottles of water and told him the fence looked great. He smiled and said, “oh, you already saw it.” Then, I handed him the cash and told him to go buy lunch for the two of them. He smiled even bigger, thanked me again and said God bless. I closed the door and tears flowed. I thanked John for touching my heart, for giving me inspiration that I desperately need. It was another small God-Wink and so very appropriate and timely for “GivingTuesday”. Enjoying nature was one of many activities that John and I enjoyed sharing. We visited many botanical gardens, beaches and parks wherever we lived. On one of our first vacations together, we travelled to Fort Myers and stayed in a resort right on the beach. One of our days was spent on Sanibel Island, home of several wildlife refuges. We devoted an entire day at the J.N. “Ding” Darling National Wildlife Refuge. There is a four-mile scenic drive around Sanibel Island which is home to hundreds species of birds, reptiles, palms, seagrapes, myrtles and other native vegetation. John loved watching me enjoy my passion – photography. He drove along the dike so that I could snap away. Whenever we saw something that caught our attention, especially a flock of wading birds, we stopped to get a closer look. As we drove slowly along the dike, I saw a lone Little Blue Heron off in the distance in the bay. He caught my eye, and I asked John to stop. We got out of the car and walked up to the edge of the water. 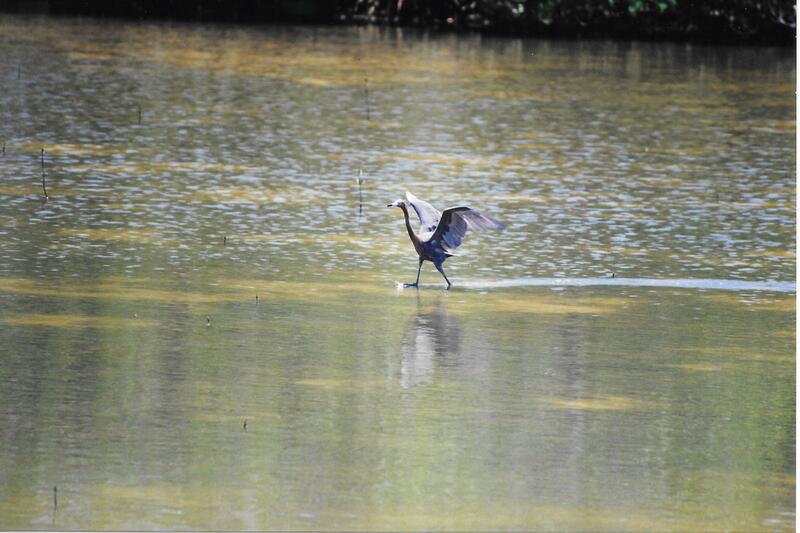 The heron was the only bird in sight, but he put on what we later called a “happy dance” through the shallow water. We were thrilled to watch and I captured the show in several still, sequential photos. 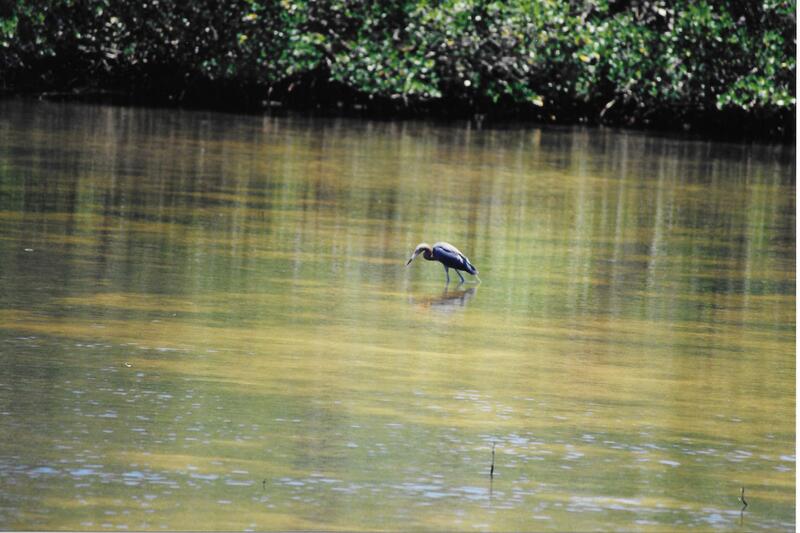 The Little Blue Heron stood in the “knee-deep” bay, and my first photo was one where he appeared to be looking at himself in the water like it was a mirror. We imagined to ourselves that he wanted to make sure his feathers were all in place, and he looked handsome and presentable. After a few seconds, all of a sudden he spread out his wings and stood on one leg. And then he started running through the water towards us. As he ran, he held his head high and held his wings out like angel wings. 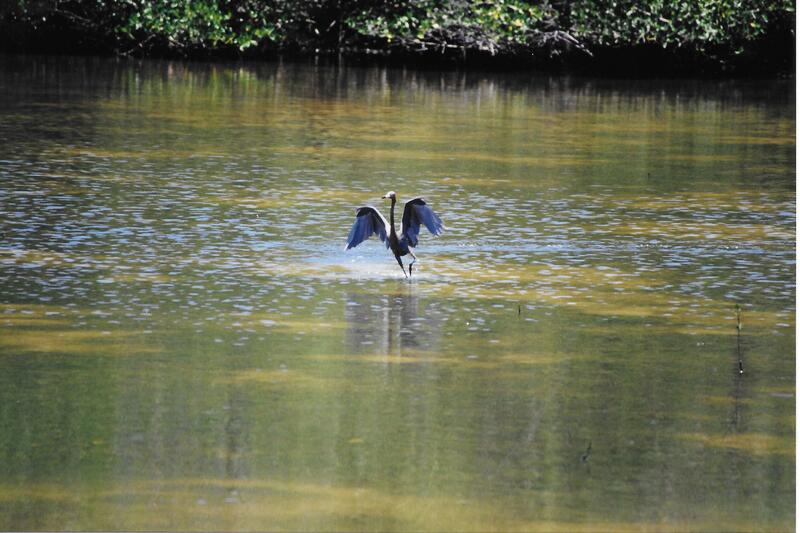 He glided across the shallow water flapping his wings up and then down and turned making a semi-circle wake in the water. Then, as suddenly as he had started his “dance”, he stopped. I caught him in this beautiful, graceful stance. 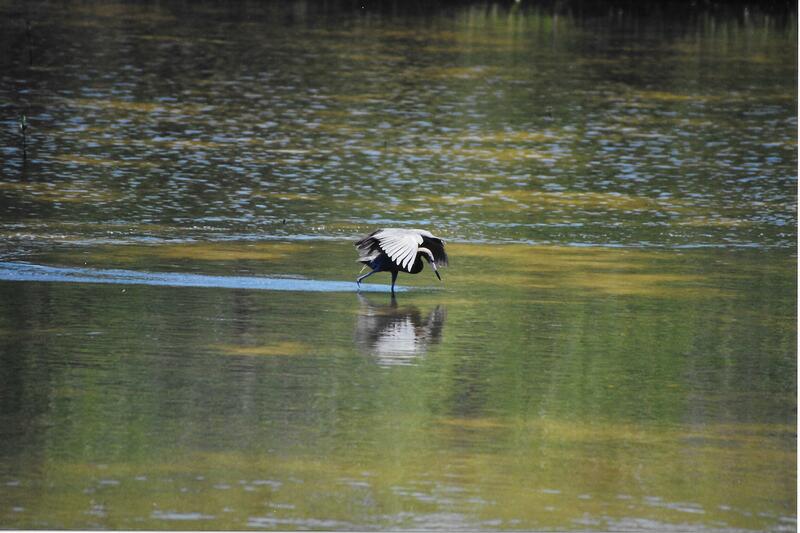 His wings were held out as he stood on one leg, as if in a “Karate Kid” pose gazing into the water again. He stood there staring into the water for several seconds, and we were sure he was pleased with what he saw. 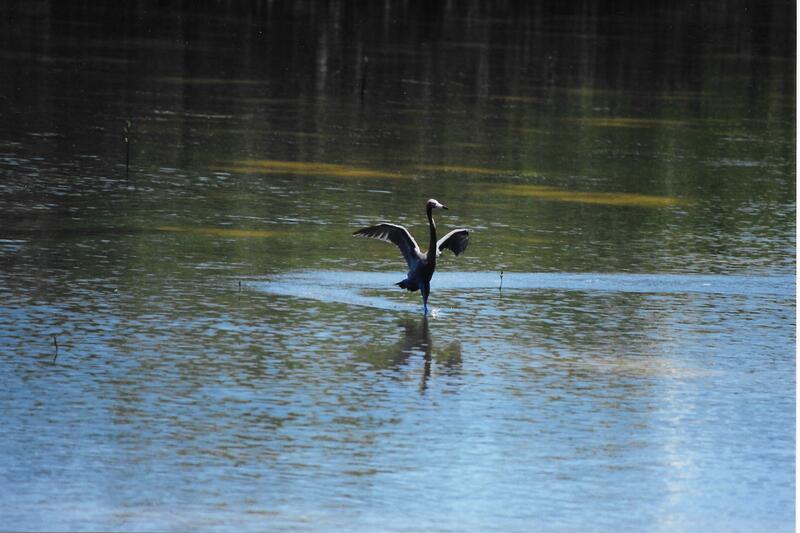 He stood up once more, raised his wings and continued sprinting and splashing back towards where he started. All the while, he danced solo as if he was wooing a mate to join him in his tango, “look at me, look at me, I’m here waiting for you!” It was a lovely sight to behold; while we stood there, he never enticed a lady bird to join him. We decided to return to the car and continue along the dike. Before John started the car, he grabbed my hand and looked into my eyes. He told me how much he loved me, and I said the same back to him. As we drove away, I told John, “that heron’s soul mate is just sitting back waiting for us to leave. They just want some privacy.” And we smiled . . .
John and I lived Richard Bach’s quote everyday: “Our soul mate is the one who makes life come to life.” We made each other’s life come to life; we were blessed with a once-in-a-lifetime bond. He didn’t have to dance to woo me; he had me at “hello”.